Burkina Faso is a landlocked nation in West Africa. It is surrounded by six countries: Mali to the north, Niger to the east, Benin to the southeast, Togo and Ghana to the south, and Côte d'Ivoire to the southwest. Formerly Haute-Volta it was a colony of French West Africa, before becoming the Republic of Upper Volta, it was renamed in 1984 by then President Thomas Sankara using native words meaning "the land of upright and honest people." The inhabitants are known as Burkinabé. Governmental instability during the 1970s and 1980s was followed by multiparty elections in the early 1990s, though one party still dominates the politics of the nation. Despite the greater political stability, Burkina Faso is still troubled by intermittent droughts, tropical diseases and HIV/AIDS, low worldwide prices for cotton (one of its major cash exports), poverty, illiteracy, and uneven population density (very high in the capital while huge areas are deserted). Burkina Faso is surrounded by six countries: Mali to the north, Niger to the east, Benin to the southeast, Togo and Ghana to the south, and Côte d'Ivoire to the southwest. It lies between the Sahara Desert and the Gulf of Guinea, south of the loop of the Niger River. The land is green in the south, with forests and fruit trees, and desert in the north. Most of the country is a gently undulating landscape with a few isolated hills. The southwest forms a sandstone massif, where the highest peak is found: Ténakourou, 2,450 ft (749 m). The massif is bordered by sheer cliffs. The difference between the highest and lowest terrain is no greater than 2,000 ft (600 m). Burkina Faso is therefore a relatively flat country, with a very few localized exceptions. The country owed its former name of Upper Volta to three rivers that cross it: the Mouhoun (formerly called the Black Volta), the Nakambé (the White Volta), and the Nazinon (the Red Volta). The Mouhoun, along with the Comoé that flows to the southwest, is the country's only river to flow year-round. The basin of the Niger River also drains 27 percent of the country's surface. Its tributaries are seasonal streams, flowing for four to six months a year, but can cause floods. The country also contains numerous lakes. Still, droughts are often a problem, especially in the north. The country's game preserves - the most important of which are Arly, Nazinga, and W National Park - contain lions, elephants, hippopotamus, monkeys, warthogs, and antelopes. Tourism is not well developed. The Sahel Zone in the north, which typically receives less than 24 in. (600 mm) rainfall a year. A relatively dry tropical savanna, the Sahel extends beyond the borders of Burkina Faso, from the Horn of Africa to the Atlantic Ocean, and borders the Sahara to its north, and the fertile region of the Sudan to the south. The Sudan-Sahel region, a transitional zone with regards to rainfall and temperature. The Sudan-Guinea zone farther to the south, which receives more than 35 in. (900 mm) of rain a year and has cooler average temperatures. Like all of Western Africa, Burkina Faso was populated early, notably by hunter-gatherers in the northwestern part of the country (12,000 to 5,000 B.C.E.). Agricultural settlements appeared between 3600 and 2600 B.C.E. The use of iron, ceramics, and polished stone developed between 1500 and 1000 B.C.E. There are remains of high walls in the southwest (as well as in Côte d'Ivoire). Probably in the late 1400s C.E. the Mossi invaded the area on horseback and occupied the plateau in the center of the country. Their further spread was limited by sleeping sickness, which affected the horses. The Mossi integrated with the essentially farming ethnic groups they conquered, incorporating many of their religious practices. During this period, slaves captured on raids were sent north to Mali or south to the Atlantic coast, whence they were shipped to the Americas, especially Brazil. In 1896, the Mossi kingdom of Ouagadougou became a French protectorate after being defeated by French forces. In 1898, the majority of the region corresponding to Burkina Faso today was conquered, though there were periodic revolts by groups resisting taxation, centralized rule, forced labor, and military conscription. In 1904, these territories were integrated into French West Africa. Originally administered as part of Côte d'Ivoire, they became a separate colony in 1919. 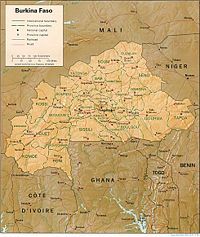 The new colony of Upper Volta was broken up in 1932 and shared between Côte d’Ivoire, Mali, and Niger. In 1947 Haute-Volta (Upper Volta) was re-created with its pre-1932 boundaries, and in 1958, it achieved self-government and became a republic and member of the Franco-African Community. Full independence was attained in 1960. The country's first military coup occurred in 1966; it returned to civilian rule in 1978. There was another coup in 1980, which in turn was overthrown in 1982. A counter-coup was launched in 1983, which left the left-leaning Captain Thomas Sankara in charge. The current president is Blaise Compaoré, who came to power in 1987 after a coup d'état that killed Sankara. The constitution of 1991 established a semi-presidential government with an Assembly that can be dissolved by the president, who is elected for a term of five years. In 2000 a constitutional amendment reduced the presidential term from seven to five years. The amendment would also have prevented President Blaise Compaoré from being re-elected. Despite a challenge by other presidential candidates, in October 2005 the constitutional council ruled that because Compaoré was already in office in 2000, the amendment would not apply to him until the end of his second term. Thus, he was re-elected in a landslide due to a divided political opposition. The parliament consists of two chambers. There is also a constitutional chamber, composed of ten members, and an economic and social council whose roles are purely consultative. Burkina Faso is divided into 13 regions, 45 provinces, and 301 departments. Burkina has excellent relations with European aid donors, as well as Libya, Taiwan, and other states that have offered financial aid. France and the European Union, in particular, provide significant aid. Other donors with large bilateral aid programs include Germany, Denmark, the Netherlands, Belgium, and Canada. President Compaore is active in subregional diplomacy in West Africa. Relations with the United States are subject to strains because of the Compaore government's past involvement in arms trading and other sanctions-breaking activity. In addition to regional peace and stability, U.S. interests in Burkina are to promote continued democratization and greater respect for human rights and to encourage sustainable economic development. Although the Agency for International Development (USAID) closed its office in Ouagadougou in 1995, about $18 million annually of USAID funding comes through non-governmental and regional organizations. Burkina has been the site of several development success stories. U.S. leadership in building food security in the Sahel after the 1968-1974 drought has been successful in virtually eliminating famine, despite recurrent drought years. Burkina Faso and the Millennium Challenge Corporation have signed a $12 million Threshold Country Program to build schools and increase girls' enrollment rates. 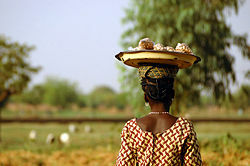 Burkina Faso is one of the poorest countries in the world, with a per capita income of $424 (2005). It ranks 175 out of 177 countries on the UN's Human Development Index. This can partly be attributed to population growth and arid soil. Agriculture represents 32 percent of its gross domestic product and occupies 80 percent of the working population. It consists mostly of livestock but also, especially in the south and southwest, crops such as sorghum, millet, maize (corn), peanuts, rice, and cotton, which is the major cash crop. Burkino Faso has been a leader in opposing cotton subsidies by the developed countries to their producers, on the grounds that subsidies encourage dumping, which results in lower world demand and prices. Some farmers in Burkina Faso are threatening to stop raising the crop because of the falling prices. An estimated three million people depend on cotton for their livelihood. The government is also trying to increase yield with better seeds and to find other uses for the cotton, such as making cooking oil. The socialist policies, including price controls and widespread government involvement in the economy, put in place under Sankara are slowly being liberalized since his assassination. Some state companies have been privatized and regulations that inhibited investment were dropped. Lack of work opportunities causes a high rate of emigration: for example, three million Burkinabe lived in Côte d'Ivoire until 2002, sending home tens of billions of CFA francs each year. The 1967 expulsions from Ghana provoked tensions. The crisis in Côte d'Ivoire led to the return of 300,000 migrants. Most of the country's imports and exports were by rail through the ports of Côte d'Ivoire. Cut off, the government moved to establish truck links instead. All electricity still comes from Côte d'Ivoire. Burkina is attempting to improve the economy by developing its mineral resources, improving its infrastructure, making its agricultural and livestock sectors more productive and competitive, and stabilizing the supplies and prices of food grains. Manufacturing is limited to cotton and food processing (mainly in Bobo-Dioulasso). Some factories are privately owned, and others are set to be privatized. The deposits of manganese, zinc, and gold have attracted the interest of international mining firms. The Burkinabe belong to two major West African language and cultural groups—the Voltaic and the Mande. The Voltaic are far more numerous and include the Mossi, who make up about half of the population and are concentrated on the Mossi Plateau in the center of the country. The population is concentrated in the south and center of the country, sometimes exceeding 125 per sq. mi. (48 per sq. km). This high population density causes annual migrations of hundreds of thousands for seasonal employment, especially during the dry season. Approximately 50 percent of the population is Muslim; Christians account for about 25 percent, and followers of traditional African religions (typically animism of various forms) make up about 25 percent. Many Christians and Muslims incorporate elements of animism into their religious practices. Most of the people in rural areas practice animism. French is the official language, but the majority of the people speak ethnic tongues, of which there are about 60. Women occupy a subordinate position and experience discrimination in education, jobs, property, and family rights. Women still do much of the subsistence farming work. The country is a source, transit, and destination country for internationally trafficked persons, including children. Children from Mali often are trafficked through Burkina Faso to Cote d'Ivoire. Destinations for trafficked children from Burkina Faso include Mali, Cote d'Ivoire, Ghana, Benin, and Nigeria. An estimated 50 percent of children work, largely as domestic servants or in the agricultural or mining sectors, where working conditions are harsh. Children commonly work with their parents in rural areas or in family-owned small businesses in villages and cities. Burkina Faso has an estimated life expectancy at birth of slightly under 50 years of age. The median age of its inhabitants is under 17. The disease of onchocerciasis, or "river blindness," formerly blinded as many as 50 percent of the middle-aged people, but the disease has been eliminated by an international campaign against it. Education is technically free and officially mandatory until the age of 16; however, few Burkinabé have had formal education. Though schooling is free, attendance is not enforced, and only about 35 percent of Burkina's primary school-age children receive a basic education. Children are responsible for paying for school supplies, which often cost more than tuition. Many parents cannot afford to lose a child's labor in the fields or at other jobs. Overall school enrollment is approximately 57 percent (51 percent for girls). Girls make up slightly more than one-third of the student population in primary schools. Schools in rural areas have even lower percentages of female students, and illiteracy for girls in the rural areas is as high as 95 percent. The government promotes primary education for girls through encouragement of donor scholarships, school feeding programs, and information campaigns to change societal attitudes toward educating girls. Institutions of higher education include the University of Ouagadougou, the Polytechnical University in Bobo-Dioulasso, and the Koudougou Ecole Normale Superieure. Burkina Faso hosts the International Art and Craft Fair, better known by its French name as SIAO, one of the most important African handicraft fairs. Burkina Faso itself is well known for its elaborate carved wooden masks, as well as weaving, pottery, wood carving, and other items associated with animist rituals. Attached to the masks are costumes made of fibers that hang to the ground. The masks belong to families and appear at burials, funerals of clan elders, initiations, and other important occasions. In animist traditions, masks are the reincarnation of the animal totem, the spirits of important ancestral elders, and of the collective spirits of the clan's ancestors. They protect and aid the members of the clan and serve as portable altars for sacrifices to the ancestors. The country also hosts the Panafrican Film and Television Festival of Ouagadougou (FESPACO), the largest African film festival. The National Week of Culture (SNC) takes place every year in Bobo-Dioulasso. ↑ INSD Burkina Faso (French) Retrieved January 9, 2012. ↑ 2.0 2.1 2.2 2.3 Burkina Faso. International Monetary Fund. Retrieved January 9, 2012. ↑ CFA Franc BCEAO. Codes: XOF / 952 ISO 4217 currency names and code elements. ISO. Retrieved May 8, 2009. Roy, Christopher D., "The Art of Burkina Faso", observed December 29, 2006. "Fragile Demoracy Being Trested", allAfrica.com, observed January 3, 2007. "Country Reports on Human Rights Practices", U.S. State Department 2005. observed January 17, 2007. Burkina Faso literature at a glance, The University of Western Australia. Burkina Faso, Encyclopedia of the Nations. Burkina Faso Premier Ministère (in French). Burkina Faso Embassy, The Embassy of Burkina Faso. Burkina Faso - Top News, allAfrica. Country Profile: Burkina Faso, British Broadcasting Company. Burkina Faso, The World Factbook. Burkina Faso Page, African Studies Center. Africa : Burkina Faso, PolyArchy. This page was last modified on 21 December 2016, at 22:46.